An automatic algorithm decides which events in the ISC database merit a review by the ISC Analysts. The decision is based on M, which is the maximum of all network magnitudes reported for a given seismic event. An event is not reviewed if M < 2.5.
a cumulative set of stations reported this event to the ISC considerably improves network geometry as compared to any single network. All events with M ≥ 3.5 are reviewed. If M is unknown, then an event is reviewed if either the number of reported hypocentres, the number of networks reporting station arrivals or the maximum recorded distance is greater than a value set individually for each geographical region. Typically this is two reporters and ten degrees of distance. 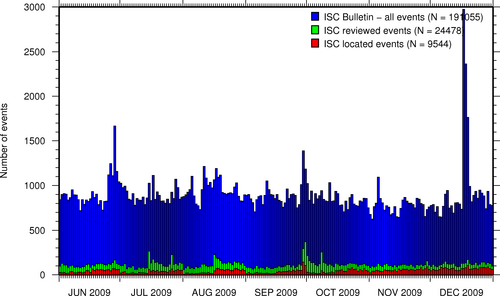 Typically the ISC analysts review approximately 20% of all events in the ISC database, currently 3,500 to 5,000 per data month. This work is done approximately 24 months behind real time to allow for the most comprehensive collection of bulletin data from networks and data centres worldwide. Users of the ISC Bulletin can rely on the fact that all seismic events in the ISC Bulletin that bear the ISC hypocentre solution have been reviewed by the ISC Analysts. The automatic process creates a monthly listing of the events for the editors to review. The analysis takes place for one month at a time and is processed in batches (therefore, an event is not finished one at a time, and only whole months are published at once). The first batch of editing consists of the editors reviewing all events for the month. The entire month is relocated after the necessary changes have been executed as decided by an editor. The editor then reviews the same events and compares the first solution and the revised solution with the changes that were made. Once an editor is satisfied with an event, it is no longer revised for the subsequent pass (iteration). But the analysis will continue in 'passes' until all events are satisfactory. The editors print the entire monthly listing, which is split up into sections separated by number of events (typically 150 events in a section). Each event (one unique ID per event) on the monthly printout shows all reported hypocentres (there can be multiple reported hypocentres for each event), reported magnitudes (when available), the geographic region and phase arrival times and phase arrival time residuals. The editors have the capability to execute a variety of commmands which can be used to move phase arrivals or hypocentres from one event to another or modify phase arrivals. There are several commands to change the depth of an event or change the starting location of the location algorithm. Look for outliers and/or misassociated phases. When editors remove misassociated phases from an event, the phases are introduced to the data flow. These phases are made available to be associated to a different event if the time and location are suitable. Along with examining each individual event closely, it is also important to look at all events (and hypocentres) reported closely in time and space to ensure that the grouping of the events was done correctly. In some cases, two separately grouped events will be merged into one event. In other cases, one event with more than one hypocentre can be split into two events, when the grouping has created one event from two closely occurring yet different events. At the end of the monthly analysis, the ISC `Search' procedure attempts to build events from the remaining set of unassociated phase arrivals reported to the ISC. The algorithm is based on the methodology of Engdahl & Gunst, 1966. The candidate events are validated/rejected by relocating them with the ISC locator. The remaining list of search events is reviewed. Those reported by stations of at least two different networks and approved by the ISC analysts are added to the ISC bulletin. For quality control, there is a set of programs that are run once a data month has been processed. These programs check for inconsistencies and errors. Engdahl, E.R. and R.H. Gunst, 1966. Use of a high speed computer for the preliminary determination of earthquake hypocenters, Bull. Seism. Soc. Am., 56, 325-336.